MSA offers several types of reliable restraint lanyards, which are primarily used for travel restriction and work positioning. 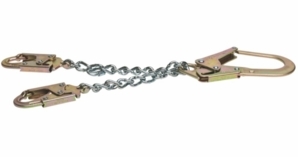 MSA 10108720 Rebar Chain Assembly Restraint Lanyard with snap hook is ideal for work positioning applications such as tying rebar or constructing concrete forms. Harness Hook Gate Opening: 2-1/4"